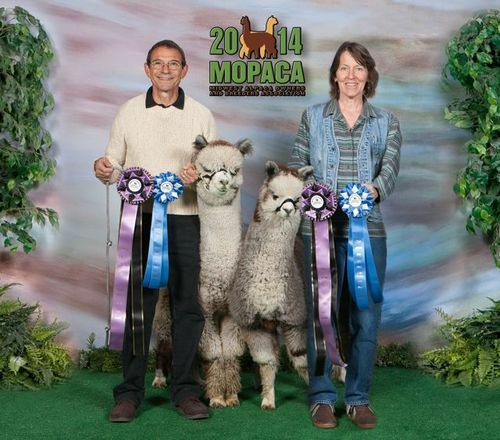 Openherd: Delphi Alpacas is a farm located in Coaldale, Colorado owned by Linda Bat & Rus Hinman. There's alpacas . . . and then there's Delphi Alpacas. Ike Is Available - inquire within! Ike (KVR's Peruvian True Eye Candy) and Avatar with their fleeces. We are celebrating our Silver Anniversary Year! 25 exciting years ago, we bought our first alpacas. We are also celebrating our fun collaboration . . . with A Paca Fun Farm. 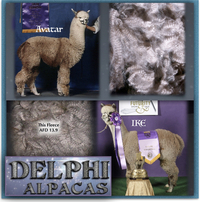 They need no introduction, as the premier breeders of gray alpacas in the U.S.
Delphi Alpacas & A Paca Fun Farm . . . . Stay tuned to see the results! Over our many years of loving alpacas (since 1993), we have had the honor of owning and managing some of the best grey herd sires in the United States. We have met our goals, and we are happy to share our success. We first saw Avatar when he was 3 days old, in 2001; and before we knew it, we were building our herd around him. In the years that followed, Avatar spoiled us, setting the benchmark for bright, fine, uniform fleece in grey. Avatar has sired 6 National Champions, in fleece and in halter. In addition, his crias have collected well over 50 championships in other fleece and halter shows, including the Futurity. In 2015, his son Delphi's Luc added the National "Best Brightness" award to the tally, at the 2015 National Fleece Show. A first, for this award going to a classic grey entrant. 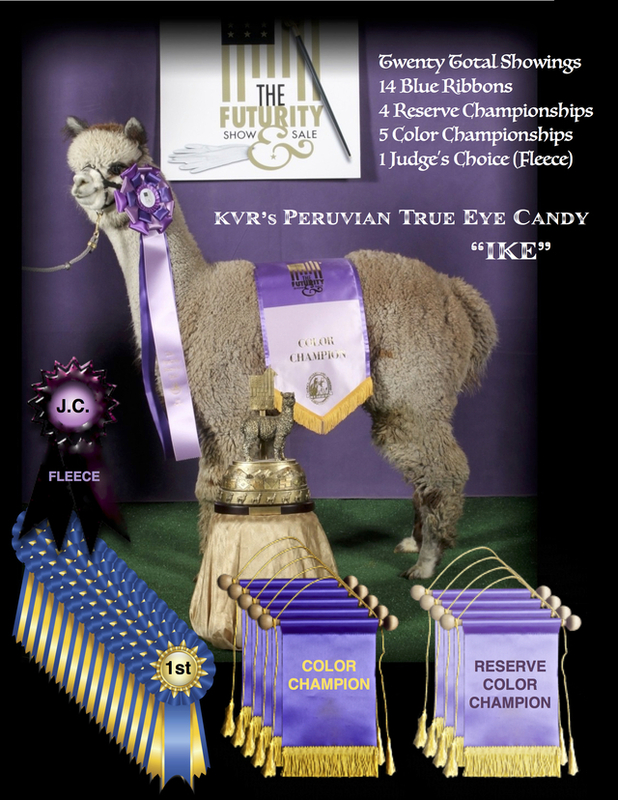 Several years ago, we also selected "Ike” to add to our grey program, (KVR's Peruvian True Eye Candy). We are inordinately pleased with this boy. A year after we purchased him he was awarded the Color Championship at The Futurity, arguably the toughest halter show in the country. His juvenile fleece won Color Champion Grey at GWAS and Reserve at CABA. His second fleece was chosen "Judge's Choice" over all huacaya fleeces at the ABR Fallfest Fleece Show. His third fleece was then selected for Reserve Champion at the 2015 Nationals. The one and only Zeppelin has also made an renowned name for himself, having won numerous Championships (including Nationals) for his fleece. 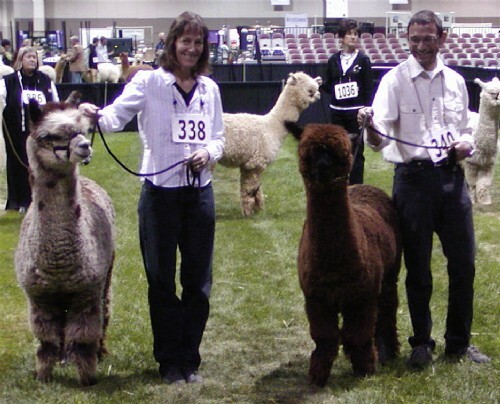 Industry leaders have recognized his rare qualities - Pacific Crest Alpacas selected him for breedings; Snowmass Alpacas has purchased his offspring and females bred to him. We have placed a particular emphasis on brightness, fineness, and uniformity, as we prize the resulting superb handle. Fleece character and weight, as well as strong conformation, complete the package. These qualities have been recognized internationally, as our alpacas have been selected for exportation to Canada, Great Britain, and Germany. Before beginning our alpaca adventure in 1993, Linda worked in the veterinary education, technology, and laboratory field for 10 years. She enjoys transferring those experiences to alpaca herd management. We maintain a small herd of approximately 25 alpacas. as well as cash discounts, and package discounts, on regularly priced alpacas. We're user friendly - zip us an offer! generally priced for cash purchases. Thanks and have fun shopping! Our "Teensy Tiny Herd Goal" means tough decisions for us, and great opportunities for you!